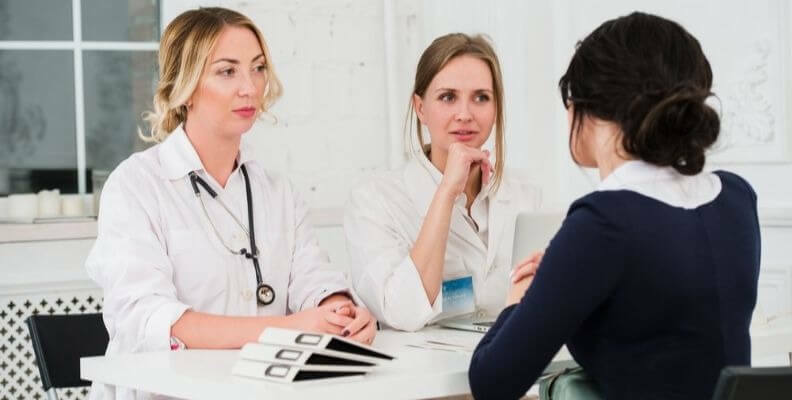 After the application and personal essay part of applying to the nursing program of your choosing, you will want to begin to prepare for the interview. An interview to get into nursing school may show that the school you’ve applied to likes what they’ve seen so far and want to get to know you better. Your answers help the interviewer, who is usually nursing faculty, decide if you have what it takes to become a nurse while they provide in-person information about their program. Here are a few ways you can prepare to ace your nursing school interview. Knowing facts about the program and nursing school you’re applying to before your interview shows that you’re interested and willing to do some homework. Check out different schools and programs to pick the best option for you by reading each school’s website. Find what each school is interested in, or which schools may have a great RN degree program, for example. Nursing school interview questions may often be similar regardless of the school, like “Why do you want to become a nurse?” Make a list of common questions and write down your answers in advance. Be sure to think big too! Give an example of how you’ve been caring or reacted in a leadership position, and point out your skills that are transferable to nursing. A school’s requirements typically show what they’re looking for in a prospective student, and you can compare these requirements to your skill set. For example, many MSN degree programs may have different prerequisites. Figure out how many of their requirements you meet and how you can show these strengths to your interviewer. Interviews are all about your strengths and knowing them will help you sell yourself during your nursing school interview. Are you hardworking, for example? What sets you apart from others? Do you have research skills, therapeutic experience or have you worked in another facet of healthcare? Don’t be afraid to talk favorably about yourself, and display yourself as an asset to the school. Use storytelling, give specific examples and be honest. Make sure you want to attend this particular program and school by asking any questions. Find out if the school is a match for you and show that you have taken the time to read up on their school. What are the faculty research priorities? What sites are used for clinical experiences? What are the matriculation and NCLEX pass rates? Remember, you are interviewing the school as well, so make sure to get answers to the questions you need to choose the best nursing program for your goals. Practice your responses in a mock interview by asking someone to quiz you. Give them a list of questions and practice your responses as if you’re really being interviewed. Be professional, as if you were applying for your first nursing job, because this is the first step toward that reality. But also, be ready to think critically and sometimes find a quick solution to a problem or question. Nurses must think on their feet, so you need to be willing to remain calm under pressure whether you know the answer or not. Dress appropriately and maintain good eye contact, remain friendly, and plan to arrive early. Make sure you turn off your cell phone and bring any paperwork you might need (transcripts, GPA, etc.) with you. Business casual is a good standard for dressing for your nursing school interview, as you want to be comfortable as well. Check your smile, use good posture, and make sure you are polished when you arrive. The school is looking for students who want to attend their programs and will fit in well. Show them you’ve done your homework by getting specific about what’s attractive to you about this specific school. Be honest and sincere. Think about what inspired you to decide on this nursing program and why you want to help people. Perhaps a person or experience in your past helped inform your decision. If your sick parent made you realize nurses are needed in the medical field, tell them that. Again, honest storytelling can make a difference here. This question is designed to measure how well you know yourself. Talk about your compassion, hardworking nature, or your ability to handle stress under pressure. Spin your weaknesses into a positive or show that you’re invested in your own self-improvement. If the school has a great program in your specialty, you can bring that up. Sketch out a 5-year plan in your mind with future goals, community initiatives and specialties to show the interviewer you are serious about a career in nursing. If you want to become a nurse practitioner someday, tell them why. Nursing programs can be demanding, so you need to show the interviewer that you are ready to take on the challenge. Mention your support system and how they help ease your situation, like a mother who’s willing to watch your child or husband that can take care of things at home for a while. Reflect on what personal coping mechanisms you use most effectively and again, be honest. Explain why you’ve chosen to apply to their school and compare that to your skills. If the program has impressive studies in your specialty or if its graduates have been more successful in their future careers, mention it. Connect the school’s vision and values to your own and explain why you are a match for this nursing school. Plan ahead and prepare for the short (2 years) and long-term (5-10 years) that are goal-driven and motivational. Answer honestly about your professional nursing goals. Reflect on personal difficulties, family problems, academic failures, or work challenges you’ve faced in the past and show how you overcame them. Describe how you prevailed. Nursing is a profession that is characterized by hard decisions and sometimes difficult outcomes, so this question is extremely relevant to the field. Nurses work under stressful conditions, so you need to show how you handle stress realistically. Every person has stressors, so point them out and mention which hobbies calm you down. Identifying what causes you to get upset can reveal a lot about your personality, and how you may react to regular triggers in the nursing field. Look back to unforgettable people or nurses who have inspired you to be strong or become a nurse yourself, perhaps someone you looked up to as a child. Mention a figure in the nursing field or in your community who embodies the values you also claim to possess. Oftentimes, in nursing, certain patients stick out and make a huge impact, so don’t be afraid to mention an everyday person who demonstrates extraordinary characteristics. Designed to determine your moral compass, this question will show the interviewer your ethical views. Ethics is a cornerstone of effective nursing practice, and cutting corners in health care can have deadly outcomes and vast legal repercussions. Your answer to this question will speak to your ability to provide safe and ethical nursing care. Be honest and think of positive things your supervisors or classmates would say. The interviewer wants to gauge what working or studying with you may be like because nurses actively work as a part of a team. Your answer to this question shows how you deal with emotionally-charged situations and address interpersonal conflicts. Convey your maturity and ability to de-escalate situations. The answer you come up with here will tell the interviewer how realistic you are about the job. There’s no wrong answer, but you need to come up with something that reflects your opinions. Now’s your chance to ask about scheduling, exit exams, clinical practicum sites, and any other questions you may have about the nursing program that wasn’t on their website.